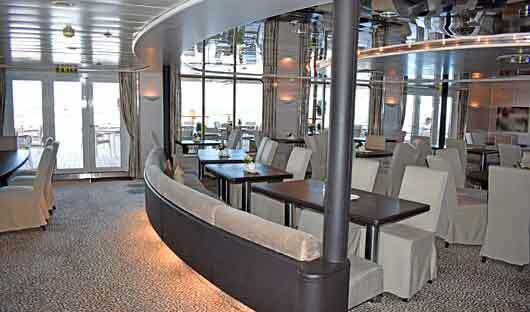 National Geographic Orion is a modern, elegant ship with an intimate ambiance. 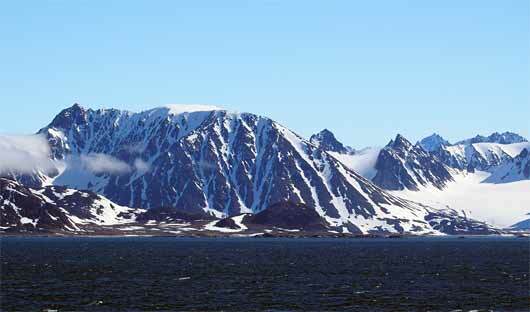 She is perfectly suited to luxury Arctic cruising. The window-lined main lounge and library offer spectacular views while the expedition community are gathered each evening for cocktails and a recap of the day’s activities. High atop the vessel, the cosy observation lounge is ideal for taking in the 270º views, or you might choose to brave the outdoor bar (with ambient heaters) on the same deck. 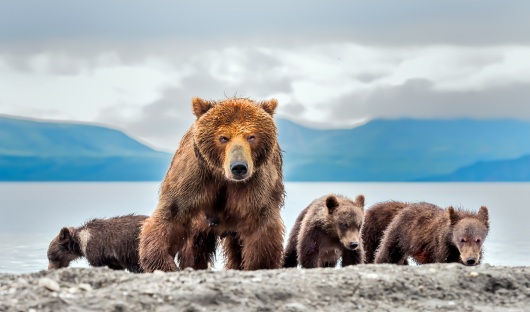 The 53 cabins accommodate 102 guests and all are exterior, with most featuring picture windows that connect you with the incredible Arctic landscapes of the Russian Far East. 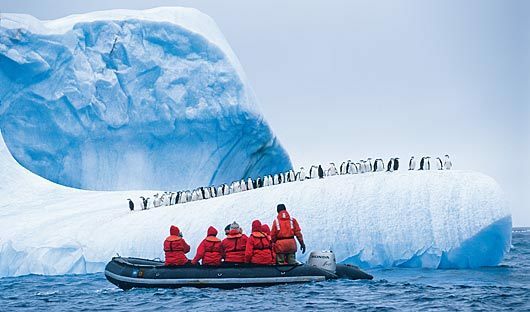 Voyage price includes bar tab & staff gratuities on-board the National Geographic Orion as well as kayaking. 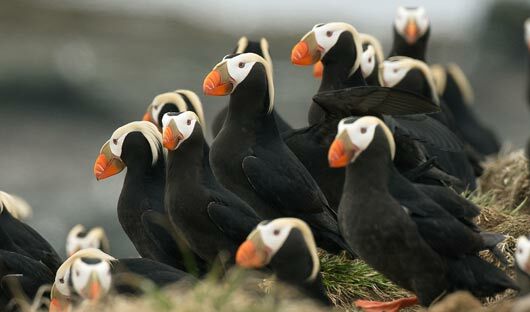 *Some itineraries require the purchase of a charter flight. 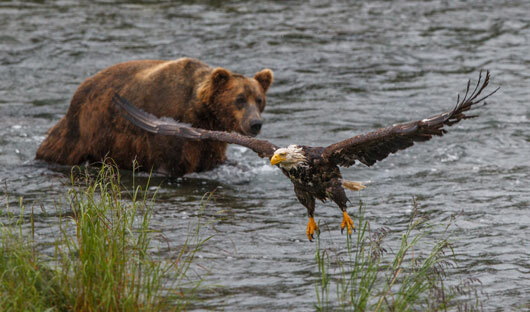 The prices on these can vary for each departure. Please contact us to find out more. 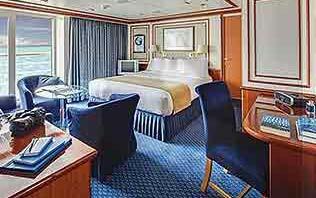 Cat 6 Owner’s Suite with French Balcony are room numbers #502, 507, 509*, 510 and are located on the Bridge Deck. These large, elegant suites feature a French balcony, with the exception of #509 which has double windows. Each provides a separate living area with a sofa and two arm chairs, except for #502, which uniquely offers a ‘soaking tub with a view’ in addition to a shower stall and expansive vanity. 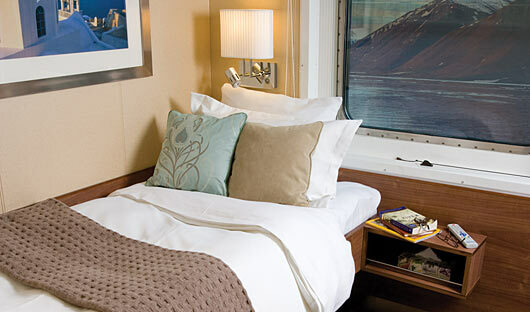 All cabins have reading lamps, a flat screen TV, and climate controls. Marble bathrooms are generously sized and include a spacious shower stall with a glass door. 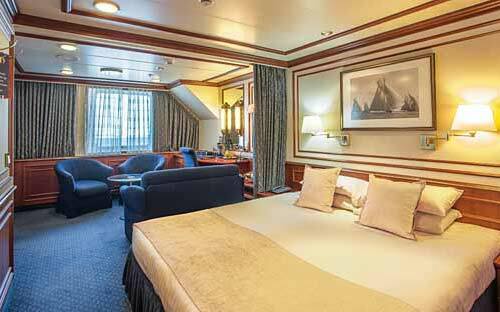 Cat 5 Suite with French Balcony rooms #501, 503-506, 508 are located on the Bridge Deck. These spacious suites feature open living areas and sliding glass doors opening to a shared French balcony. Beds are configurable. A sitting area with arm chairs and a sofa, a writing/laptop desk, well-placed reading lamps, a flat screen TV, and climate controls complete the decor. Marble bathrooms are generously sized and include a spacious shower stall with a glass door. 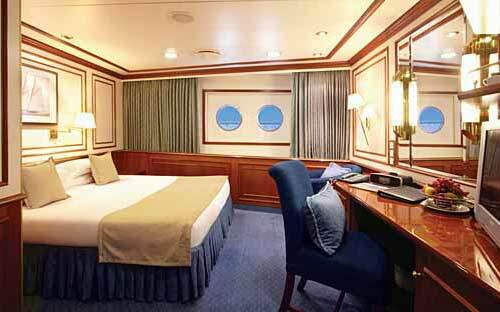 Cat 4 Deluxe Suite with Window room #511, 515 are located on the Bridge Deck. These two suites feature separate sleeping and sitting areas, with a chair and armchair and a two-cushion sofa facing an expansive window. Beds are configurable. Ample storage, reading lamps, a flat screen TV, and climate controls complete the amenities. Marble bathrooms are generously sized and include a spacious shower stall with a glass door. 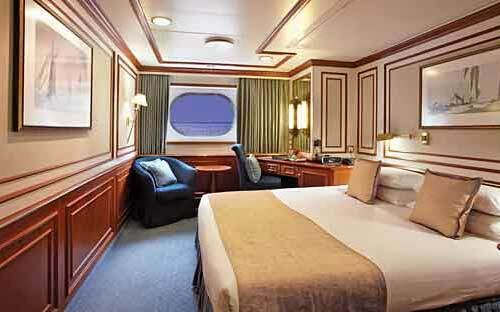 Cat 3S Suite with Window room #512 is located on the Bridge Deck. This solo suite features two beds and two large windows, plus two armchairs and small table, reading lamps, a flat screen TV, and climate controls. The marble bathroom is generously sized and includes a spacious shower stall with a glass door. 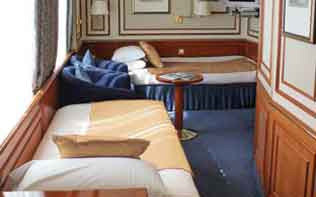 Cat 3 Suite with Window room #401-412, 414-419 are located on the Upper Deck. These suites feature a sitting area with a large window, a sofa–except slightly smaller #401 & #402–an armchair or two, writing/laptop desk, reading lamps, flat screen TV, & climate controls. Beds are configurable. Marble bathrooms include a spacious shower stall with a glass door. 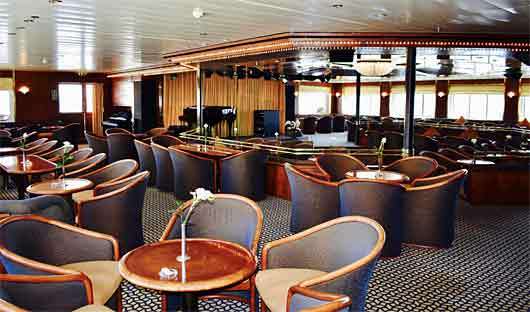 The main lounge is the social heart of the ship, on this deck, along with the outdoor café where breakfast & lunch are served. Cat 2 room #302-312, 314, 315, 317 are located on the Main Deck. Cabins feature a luminous oval window and configurable beds: two single beds, two beds converted to a queen-size bed, or a queen size bed. An armchair, reading lamps, a flat screen TV, and climate controls complete the amenities. Marble bathrooms are generously sized, and include a spacious shower stall with a glass door. 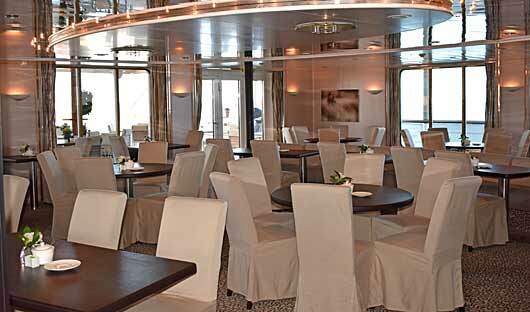 Dinner is served in the dining room, located on this deck. 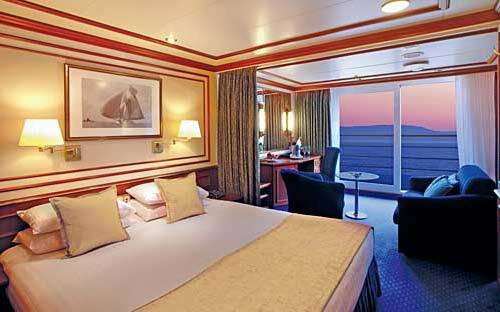 Cat 1 room #316, 318-321 are located on the Main Deck. Cabins feature a luminous oval window and configurable beds: two single beds, two beds converted to a queen-size bed, or a queen size bed. An armchair, reading lamps, a flat screen TV, and climate controls complete the amenities. Marble bathrooms are generously sized and include a spacious shower stall with a glass door. Dinner is served in the dining room, located on this deck. 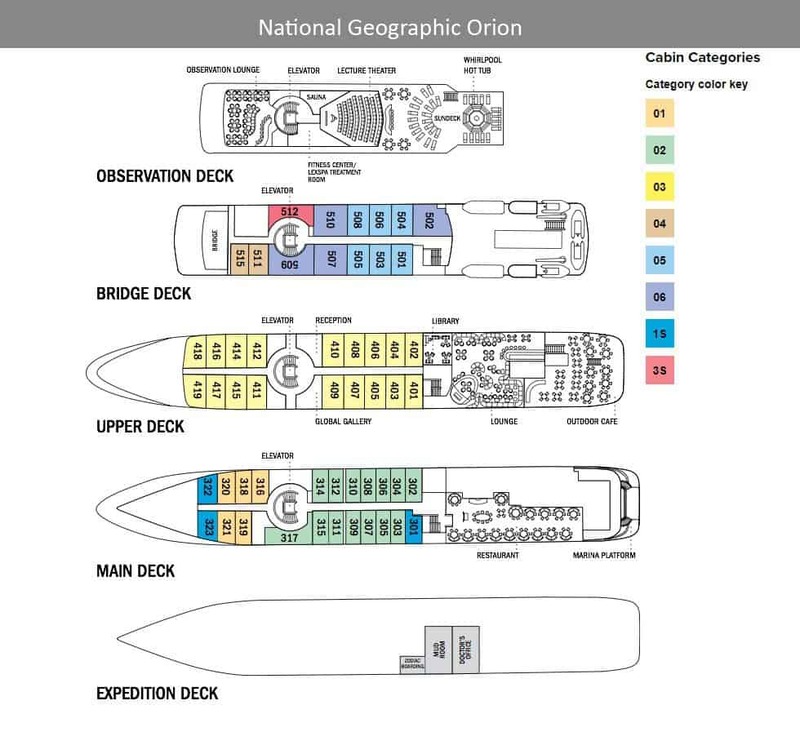 Cat 1S room #301, 322, 323 are located on the Main Deck. 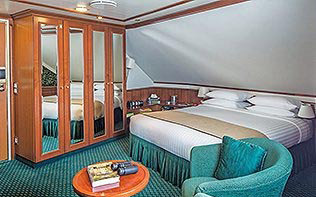 These solo cabins feature a window or two portholes, a queen-size bed, except for #301 which has a double bed, writing desk and chair, climate controls, reading lamps, and a TV. Marble bathrooms are generously sized and include a roomy shower stall with a glass door. Dinner is served in the dining room, located on this deck.